Late last night, a volunteer rescue team from the Oregon Humane Society assembled to rescue a dog trapped in the fish ladder in Little North Santiam River in Lyons, Oregon. The dog, a pug mix named Jezebel, was swimming in the creek with her family when she was caught in the current and was swept into the covered fish ladder. Marion County Emergency Dispatch contacted OHSTAR last night at 7 pm to request their assistance. Elkhorn Volunteer Fire Department also responded to the scene. The Oregon Humane Society Technical Animal Rescue team (OHSTAR) deployed five members to the scene in response to the emergency dispatch. Jezebel was swept into the covered fish ladder, going through churning water and openings meant for fish until reaching a calmer section of the ladder. The pug mix managed to secure herself against the ladder, hanging onto the rungs and crying for her family. Rene Pizzo, OHSTAR team lead. 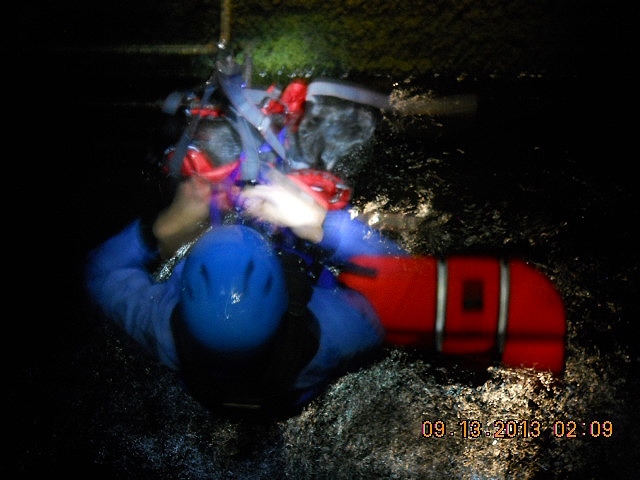 OHSTAR team member Ulli Neitch entered the fish ladder, secured by a safety harness and belay line. Neitch was able to catch the dog and secure her with a rescue harness. Jezebel was passed back to Pizzo and lifted to safety by additional OHSTAR team members. Owner Shardell Bodda says that Jezebel is doing well, but is very tired from her ordeal. "Jezebel is one lucky pug mix," said Pizzo. OHSTAR receives no tax dollars and is supported entirely through private donations to the nonprofit Oregon Humane Society. Donations to support the work of OHSTAR and other OHS programs can be made on the OHS website at www.OregonHumane.org. Posted in Animal Welfare and tagged with Rescue, OHS. September 13, 2013 by Spot Magazine.